Pablo Warner is back at forward for preseason No. 2 Iolani. The target on Iolani's back isn't quite as big as it has been. The Raiders had their string of five straight state championships come to an end last season, but are poised to start a new streak. Ten returnees from last year are part of the reason Iolani is ranked second in the Star-Bulletin Basketball Preseason Top 10. The formula for success is still the same for the Raiders. They will have more depth than anybody in the state and will use it to their advantage. They will hound teams for a full four quarters up and down the court, pushing the ball on offense and frustrating teams with their electric speed on defense. The individual stars like Bobby Nash, Derrick Low and Kyle Pape aren't there, but the team is as strong as ever. They will also have plenty of time to incorporate six new faces that just finished playing football and only joined the basketball team a few days ago. After hosting the Iolani Classic next week, Iolani will travel to Tennessee to take part in the Arby's Invitational Classic. Even without almost half the team, the Raiders are 3-1 in the preseason, with their only loss coming in the final seconds to Punahou. You can expect it to be that way all season between the two ILH rivals. On paper: Junior forward Pablo Warner is quick and explosive and has been Iolani's leading scorer in the preseason. Taylor Mounts, a 6-foot-6 senior, will be a big inside presence offensively and defensively. 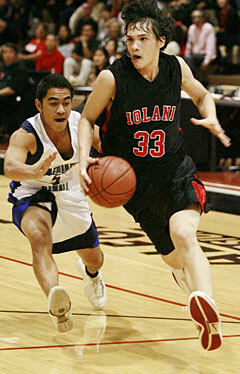 Senior Bricen McCartney brings a 3-point shooting presence and Berton Wong is one of Iolani's top defenders. The sleeper of the team could be freshman Trevyn Tulonghari, who can do just about anything on the court and could be the Raiders' best all-around player. The skinny: The normal routine of having a starting unit and then role players off the bench doesn't apply to the Raiders. They are 12-deep and experimenting with different combinations as coach Mark Mugiishi tries to determine what five is best for certain situations. They will continue to pressure teams on defense and try to force easy scores in transition. X-factor: The depth on the bench is what separates Iolani from most teams in the state. Mugiishi plans on using all 12 players and will get more production out of them if they are able to mature quickly. Six kids on the team just started practicing after playing football, so it could be a few more weeks before the team begins to find some cohesiveness.